This is NOT a replica jersey, this is exactly the same jersey that we supply the pro riders of the ARKEA SAMSIC team, with the only exception that each member of the pro team has their own made-to-measure jerseys that take into account the different and varied body shapes and sizes. Above all, highly comfortable and breathable as governed by the choice of the fabrics used in the design to give an aesthetic crease-free look. Designed to be forgotten that you are wearing it, it is though strong and durable made with fabrics that are particularly resistant to frequent washing and the hurly-burly of pro-level road racing. - The fabrics used have been specifically designed for top-level road racing are light, soft, breathable and aero. - Made in Spain using Italian fabrics. - Designed and developed with the valuable input and feedback of the ARKEA SAMSIC team. - Windproof chest panel with hidden full-frontal zip. - Aera fabric used for the sleeves with hem-free silicone inserts at sleeve ends. - Micro-perforated afbric used for the side panels (breathability and stretchability). - Perforated fabric used for the back panel (for its breathability). - 4 back pockets including an eco-pocket for bar wrappers and used gels (ride and respect). - Full elasticated waist hem with silicone. 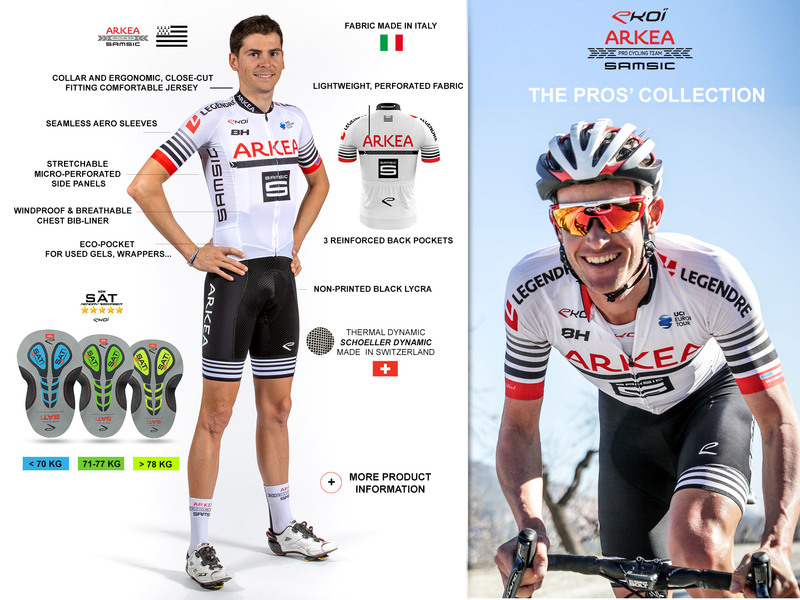 EKOI is extremely proud to announce that it has been selected as the official supplier of clothing to the ARKEA SAMSIC Pro Cycling Team. Our stylists and our textiles engineer have worked hard and for a long time on the Team’s kit; this partnership with the ARKEA SAMSIC Pro Cycling Team has been a real challenge for us as the team’s riders come in all shapes and sizes and in some cases very different, though within the aim of providing a full range of performance clothing that is perfect for each and every one of them. We understood, from the outset, that it would be a rare and privileged opportunity to discuss clothing with a champion such as André Greipel who has 14 seasons’ experience within the pro peloton and who has the advantage of unrivalled experience to assist us in developing our products. - Technical features of breathability and ultra-fast drying capacities. - Comfort: unrestricted freedom of movement and the use of soft fabrics without forgetting the different types of pad for the bib shorts. - Aesthetics: avoid creasing and non-ergonomic cuts. - Strength: a pro rider’s clothing is subject to severe testing during races and training, and frequent machine washing. All this research has enabled us to further develop our range of textiles as we have achieved with our helmets thanks to AG2R LA MONDIALE and our eyewear thanks to DECEUNINCK QUICK STEP. With the ARKEA SAMSIC , AG2R , DECEUNINCK QUICK STEP , ROOMPOT CHARLES , DELKO MARSEILLE PROVENCE pro cycling teams, not forgetting the individual eyewear contracts we have with champions such as Alexander Kristoff, Fabio Aru, Juan Molano , Sven Bystrom TEAM UAE , David Gaudu TEAM FDJ and Nacer Bouhanni TEAM COFIDIS plus one hundred other pro road cyclists who use EKOI’s products, who make up our unique testing laboratory for the whole range of our products. And all of this to achieve our ultimate goal, THE FULL SATISFACTION OF YOU, OUR CUSTOMERS.